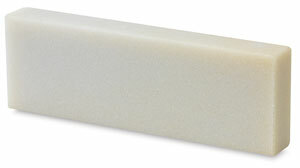 Use these sharpening stones for maintaining a mirror-honed edge on your tools. Arkansas Sharpening Stone — Due to its ability to impart the highest perfection to the cutting edge, the Arkansas Stone takes its place as the aristocrat among sharpening stones. Natural stones are quarried from the finest Ozark novaculite (silicon quartz) deposits, precision sawn to size, and finished to exacting surface configurations. Hard Arkansas stones are the finest-grained and most dense natural stone available. This stone has a hard, translucent, ultra-fine finish that has a very low metal removal rate. Use it to impart a mirror finish to your knife’s edge. Double-Sided India Sharpening Stone — India sharpening stones are manufactured using a proprietary process that impregnates them with a petroleum-based product that allows the lubrication used during the sharpening process to stay on the stone’s surface. As a result, the metal from the object being sharpened and small pieces of abrasive that break off the stone become suspended in the lubricant. This prevents these materials from imbedding into the sharpening stone’s surface, keeping it free-cutting and easy to clean. The Large Round India stone and Medium Rectangular India stone are double-sided, with a coarse side and a fine side.